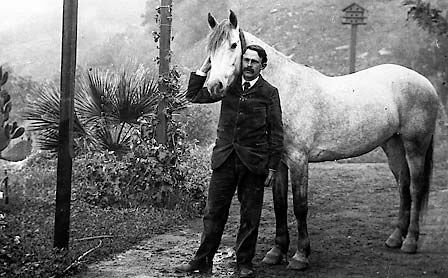 It was in 1888 that Sherman Thacher took up a homestead claim of 160 acres in the Ojai Valley. At first he thought he might teach as a side line which would furnish him some means of livelihood. The idea of a school was gradually developed and the first pupil came to the “Casa de Piedra” ranch in 1889, and while being educated by Mr. Thacher, he was given the opportunity to develop a wholesome outdoor life. Mr. Thacher’s original plan was not to remain in the valley, but to stay only temporarily, then journey on to destinations unknown. As fate would have it, the beauty and charm of the valley grew on him. He soon noticed that the outdoor life agreed with him and he saw success ahead which spurred him on. His teaching began with the one pupil from the east and eventually, more came. Sundays, holidays and off school hours were devoted to improving his property. He even built a house with his brother’s help. His brother, William, was also involved in civic activities and was responsible for founding the famous tennis tournaments held annually in Ojai. With the addition of more pupils the ranch soon developed into a full time school. More suitable buildings were added year after year. Mr. Thacher was certainly well qualified to run a school, he had graduated from the Yale University in 1883, in 1884 entered the law department of Yale University, graduating in 1886. He practiced law in Kansas City, Missouri, and in 1887 came to the town of Nordhoff in the Ojai Valley. In 1896, he married Eliza Seely Blake, a native of San Francisco who was a graduate of the University of California in 1895. They would become the parents of six children. 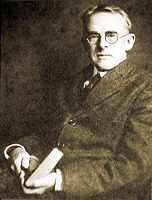 Mr. Thacher served as headmaster of the school until his retirement in June, 1931. He had been associated with the scholarly and cultured life from his early childhood. He was a kind and generous man and a valley leader. Along with his school he had been; president of the board of trustees of Nordhoff High School from 1908 until 1922, trustee of the San Antonio school district from 1898 until 1912. He was a member of the Ojai Valley Men’s League from 1910 until 1920, director of the Ojai Civic Association, and a member of the Ojai Valley Presbyterian Church since 1887. Mr. Thacher worked closely with his friend Edward D. Libbey, to change the entire face of the downtown of Ojai. He was the paternal great-grandson of Roger Sherman who was born in 1721 and best recognized as one of the founding fathers who helped draft and sign the Declaration of Independence and laid the foundation for our current-day Treasury Department. throughout the world, acknowledge their debt to the Thacher School for a wholesome education that has been an opening to the resources of a broad and fundamental life. Before his death in 1931, his devotion to the valley that he loved was without thought of personal gain, he created a school of high scholastic standing, a lasting monument so recognized by educators of renown to be one of the finest schools to ever serve the students that arrive yearly from all parts of the world. Do you have any information about Lynford Stewart and Elizabeth Stewart who lived in Ojai for many years and were active in the Arts Center and the Jazz part of the Ojai Festivals?